The award-winning contemporary music group Syzygy Ensemble have, in their short time together, made an impressive impact. 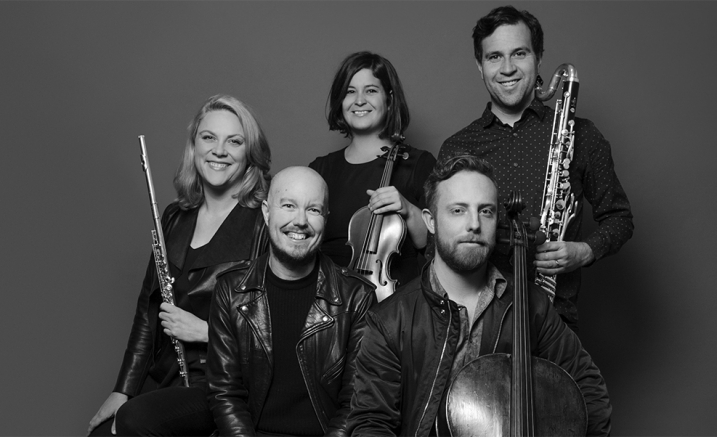 They have quickly gained a reputation as one of Australia’s finest new music ensembles, lauded for their virtuoso precision, original programming and ability to connect viscerally with their audiences. Beginning with the first of Debussy’s three sonatas, Syzygy Ensemble surveys the last hundred years of dance music. In Debussy’s masterful trio we dance for sensual pleasure, in Jolivet’s Alla Rustica we do a pagan dance to usher in plentiful crops for the coming season. Finally, we pulse to the sounds of the Paris underground with Mantovani’s epic and wildly hedonistic ‘Rave Party’, D’un rêve parti. Hear one of Australia’s finest new music ensembles, lauded for their virtuoso precision.